When the hunger hits you in Frontierland of the Magic Kingdom, then Pecos Bill Tall Tale Cafe and Inn is the Quick Service Dining location to check out. This Disney World favorite has great theming, lots of seating, a fixings bar with a grilling station, and the self proclaimed "Best Grub In The West!" One unique feature of Pecos Bill Tall Tall Inn and Cafe is the special Toppings and Fixings Bar. It has a special station that grills onions and mushrooms that you can put on your burgers (at no extra charge). There are also other burger toppings available to make the buger of your dreams. 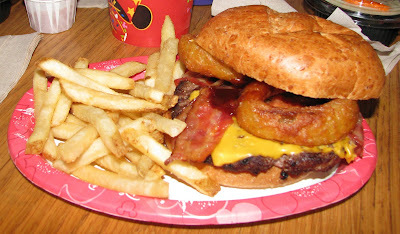 Disney has created their own "dream burger", the newly added to the menu: Deluxe 1/3 lb. Angus Cheeseburger. They have created a cheeseburger and added Bacon, Onion Rings, and Barbecue Sauce to make a very tasty burger. For those that want to take it over the top, they can take their Deluxe Burger to the Toppings and Fixings Bar and add even more to it, making a Super Deluxe Burger. Speaking of Super Deluxe Burger, the folks at Disney Blog: Progress City USA like to take their Deluxe Burger and fill the center of the onion rings to the top with grilled onions. The seating areas are well themed and there are several different rooms to choose from. The room pictured is set up to make you feel like you are outside. If you get a chance visit Pecos Bill Tall Tale Cafe and Inn early in the day before it gets crowded so that you can check out all of the interesting theming and details. Recently they have also added special self service lines in which you place your order on computer kiosks. The line we tried recently was set up specially for people on one of the Disney Dining Plans and the computer walks you through your Quick Service Dining Credit options and choices. It was fun to use and the lines were much shorter than the traditional lines that were also available. I would expect to see more of these self service stations popping up around the Disney Parks in the future. The Pecos Bill Tall Tale Inn and Cafe takes up a lot of real estate at the end of Frontierland. There are multiple entrances. These entrances are set up to blend in with the theming and decor of the surrounding area. You will notice a big difference between the look of the front entrance in the heart of Frontierland (pictured above) and the back entrance that is located on the walkway that is the transition between Frontierland and Adventureland (pictured below). If you are spending your day at the Magic Kingdom during your Disney World vacation and you are in the mood for a burger then Pecos Bill Tall Tale Inn and Cafe is the place for you. The theming is great and the Fixings Bar with the added extra of having fresh grilled onions and mushrooms makes this the best burger spot in the Magic Kingdom. Even though there is a lot of seating, it can get very crowded here during the busy lunch times. If you eat a little early (11:00 am - 11:30 am) you can beat the crowds and enjoy your dining experience even more. 2 comments to "Disney World Dining - Pecos Bill Tall Tale Inn and Cafe"
I'd love to see more CS locations use the electronic ordering. I love it at Captain Cook's at the Poly. Hedy, The electronic ordering was very similar to that at Captain Cook's, but since it was focused on Disney Dining Plan Customers it not only did a great job of telling you what your choices were, it handled the payment, so you didn't have to proceed to a spearate cashier.